Childs play, India has been submitted to ‘How We Play’ on National Geographic. Kristian Bertel has contributed to the Nat Geo Your Shot community with an assignment called ‘How We Play‘. In the assignment curated by Kristen McNicholas, an associate photo editor at Nat Geo Your Shot, we should think about how old some of our traditional games are. Early forms of soccer started thousands of years ago. While we may not know why we play, we know we always have and always will. So for this assignment, Nat Geo want us all to share the different ways we play and the diversity in the different and similar ways that we play. Ball games, board games, card games, puzzles, video or arcade games, dance, music, with our family or on our own. As Kristen is saying it: ”- One reason for that is that much of human development and behavior depends on how we play or find enjoyment in activities. While doing some scholarly research for this assignment, I learned that scientists of all fields have a difficult time defining the function of play, and the why of play. And I want to know the stories behind them, so use your captions to tell me why these activities are important to you, your heritage or your culture”, she says. Play can also influence one’s social development and social interactions. Much of the research focuses on the influence play has on child social development. There are different forms of play that have been noted to influence child social development. One study has explored that the influence of playing styles with mothers versus playing styles with fathers and how it influences child social development. Social benefits of play have been measured using basic interpersonal values such as getting along with peers. One of the social benefits that this researcher has uncovered is that play with parents has proven to reduce anxiety in children. Having play time with parents that involves socially acceptable behaviour makes it easier for children to relate to be more socially adjusted to peers at school or at play. Social development involving child interaction with peers in India or in the rest of the world is thus an area of influence for playful interactions with parents and peers. In young children, play is frequently associated with cognitive development and socialization. Play that promotes learning and recreation often incorporates toys, props, tools or other playmates. Play can consist of an amusing, pretend or imaginary activity alone or with another. Some forms of play are rehearsals or trials for later life events. 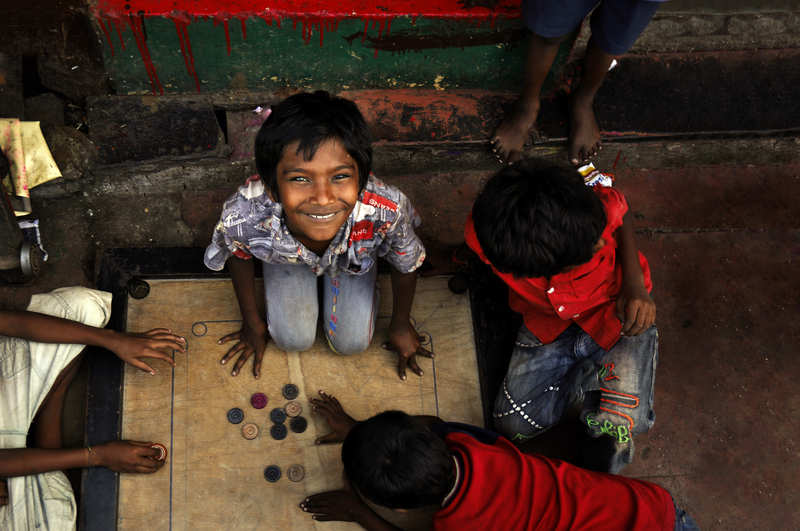 In the photographer’s submitted photo a couple of children are playing a game in the southern part of Mumbai in India. ”- Play is considered to be important for a child’s development and it is through play that children at a very early age engage and interact in the world around them. Learning through play has been long recognized as a critical aspect of childhood and child development”, the photographer Kristian Bertel says.